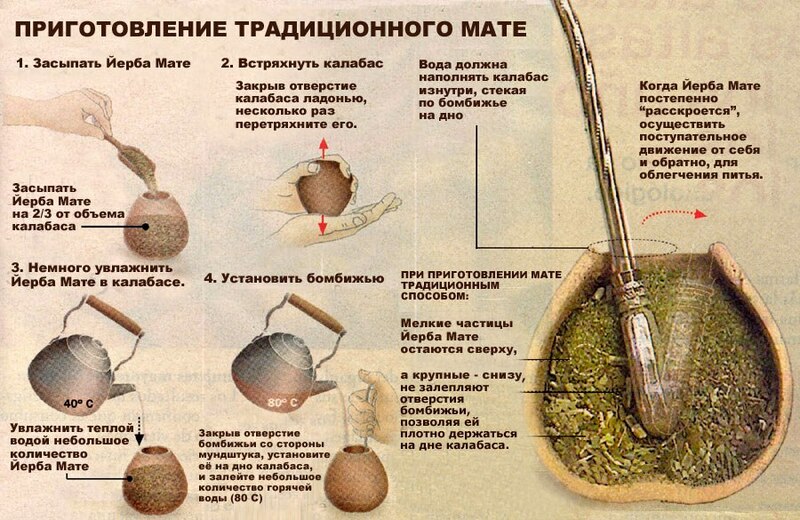 Mate - a drink of Latin Americans, many of them prefer him tea, and coffee. What kind of drink and how to make and drink, read the article. 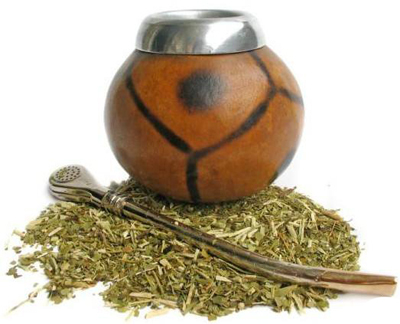 yerba mate drink is obtained from the dried leaves and young shoots of evergreen holly parahvayskoho. It is great tones due to the presence of caffeine, and contains many useful substances. for example, vitamins, potassium, phosphate, iron, sodium, magnesium, manganese, silicon, zinc. It has more antioxidants, than in green tea. Mate activates all life processes of the organism, enhances brain activity, boosts immunity, It relieves pain in muscles overtrained athletes, It promotes weight loss due to the reduction of hunger, reduces nerve stress overload. Nonaddictive, It is not a drug, taste tart, saturated. Mate is brewed and drunk from a special vessel - Calabar, who previously produced from a small pumpkin, and now they are also made of glass, metal, plasty, pottery, wood. Actually "mate" is translated from the language of one of the Indian tribes and means "pumpkin", and that kalabas Pumpkin best remains a need for a beverage temperature. For drinking yerba mate from kalabasa has a special tube-bombizhya (or fish is). She's a little bent, the top has a mouthpiece, and below the filter mesh for straining. The best are made of bamboo bombizhi. Take the dry tea leaves Yerba Mate and fill in the 2/3 Calabar (place to start and a couple of teaspoons). Close the hand of his hole and shake several times to a better distribution of the mixture. warm water (40aboutWITH) slightly moisturize the mixture to a thick slurry, and set in kalabas bombizhyu, to the bottom, closing the finger hole side of the mouthpiece. Now pour hot water (cooled to 80aboutWith boiling water), almost to the top. steeping time is very fast - no more than two or three minutes, mate need to drink almost immediately, because further drink starts to taste bitter. While drinking bombizhyu tilted a little from side to side, to make it easier to drink. Important: Once the entire mat is drunk, It may be a few more times to fill in the same tea leaves.